Over the past four days in Sangkhlaburi, I have thought time and again about how I would start this piece – where usually I might be stuck for a catchy, witty or insightful introduction, here they are aplenty, such is the power of this place to really affect you, and to have you in awe of its sheer beauty. The danger being, of course, that with every new thought that pops into my head, the greater the chance becomes that I will forget the last. 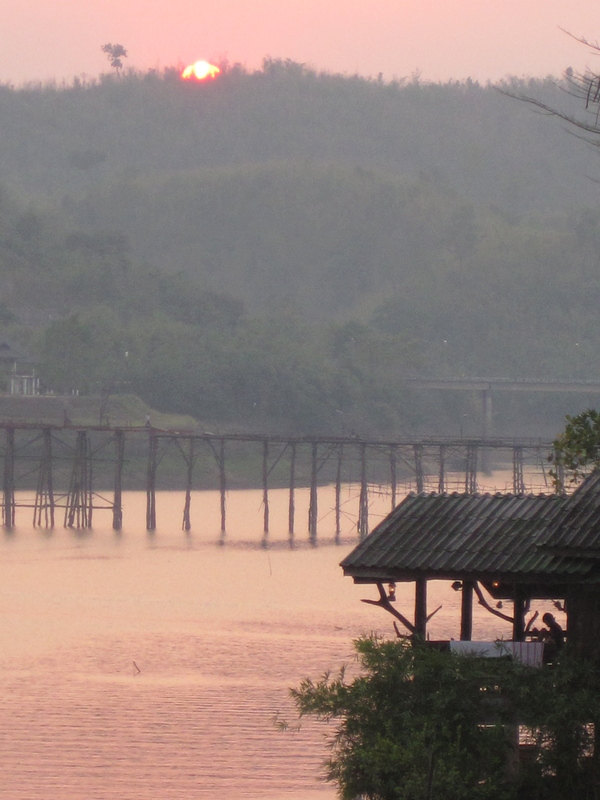 The peace and tranquility of this place is shown by just how dull some of my photos are probably going to look when I get home – the same old shots of little boats on the lake, and a rickety old bridge joining Sangkhlaburi town with the Burmese Mon village. Beautiful, idyllic, scenes of paradise, yes. But also potentially boring photogenically. Because nothing happens here. Fishermen go about their day-to-day business and that’s about it. This is Thailand as it should be, and as it probably was in most places a decade or two ago. Sure, there is a 7-11 (like everywhere reachable by road in this country! ), and a smattering of guesthouses. Even sweet little Am, whose restaurant I seem to have spent most of my trip in, has English menus printed up for tourists. None of these are bad things at all – they make life easier, after all – but what is nice is the pace of life. Everyone knows things go slower in Thailand, but here is a different story altogether. Sangkhlaburi is the most laid-back place I’ve visited in the whole country yet. There’s no hurry about anything, no worries – and it’s infectious. In very few other places (perhaps nowhere) would I be able to sit for hours in a restaurant, staring into thin (but very humid) air and just thinking, eating and drinking, the way I have today, or yesterday, or the day before. But here I can. I am the sort of person who finds it quite difficult to relax – I’ll be the first to admit that. Sitting around doing nothing does not come easy, and of course the sweltering midday heat is often of little help either. But there is something about Sangkhlaburi that makes it easier – the locals lead the way with that typically Thai, laid-back, why-over-exert-yourself-when-you-can-have-just-as-much-fun-with-half-as-much-energy attitude, and to be honest it is pretty hard not to agree, give in and follow suit. I seem to think this of just about every place I visit in Thailand, but Sangkhlaburi is another one of those places I could really see myself living. A little house by the lake would suit me just fine! In fact, sitting in my pensive state after lunch today, this seemed to be just the sort of place that would fit very well in a story about an expat’s life – teaching or writing by day, with a slow walk to a long-laid back lunch every afternoon, and dinner under the Thai night sky. The stuff of dreams, and the perfect substitute for the Ligurian village in Ripe for the Picking, the book I am reading at the moment about an English woman living amidst the olive groves of the northern Italian hills. That sort of Mediterranean lifestyle always appeals but, to be frank, give me the choice and I’ll pick Thailand any day. I remember once reading an article about the ultimate relaxation spot in what I think was Turkey – an isolated spot nestled away in the mountains somewhere; no links with the outside world, but as much massage, body wrap and hot-and-cold stone treatment as you could manage. The journalist had just broken up with a long-term partner and, having had a bad experience of a hazy, drunken rebound in her past, had vowed not to let history repeat itself. Instead she had opted for this oasis of tranquility as an escape from reality, a chance to think things over and get to know herself once more. I longed at the time to get to this place, to feel the seclusion. I still would’t be in any hurry to say no, don’t get me wrong – but if Sangkhlaburi, and Thailand in general, have taught me anything, it’s that everyone has their own idea of peace and tranquility, of paradise. Sangkhlaburi is mine now and, knowing what I do, I would choose here for my mid-life crisis downtime faster than you can say ‘yoga’. For now, though, 4 days will just have to do.